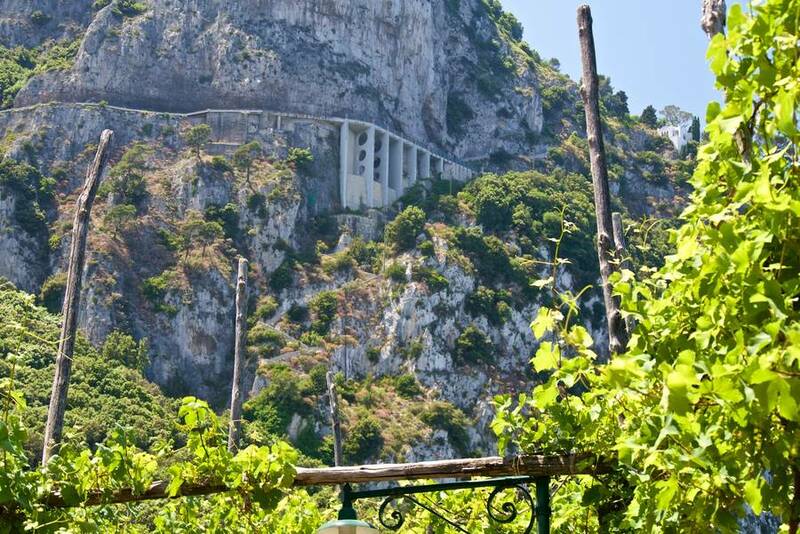 Once the only connection between the port of Marina Grande and Anacapri, the town located on the slopes of Monte Solaro, the Phoenician Steps are now a major tourist attraction: 921 stone steps from where to admire the island of Capri in all its glory. Until only a few years ago, it was believed that the steps had been built by the Phoenicians (hence the name). Recent historical research has revealed that the steps were, in reality, constructed by the Ancient Greeks, between the 7th and 6th century B.C. Up until 1874, the year in which the carriageway between Capri and Anacapri was completed, the steps represented the only connection between Anacapri and the rest of the world. Anacapri had no wells and the only source of fresh water on the island was the Truglio spring, in the vicinity of the port. As a consequence, the town's womenfolk were obliged to walk down the near 1000 steps and climb back up them (with a heavy vase of water balanced on their heads! ), each and every day. In the same way, only this time with the help of donkeys, building material, correspondence and the cumbersome trunks belonging to the first travelers to visit Anacapri were transported up the steps. The Phoenician Steps begin in Marina Grande, close to Palazzo al Mare. To reach them from the port, you'll need to walk 400 meters or so along Via Palazzo a Mare until you come across a brick ramp and a majolica sign indicating the start of the steps, to your right. Whilst the first set of steps are shallow and easy to climb, they quickly become steeper . As you make your way up the steps, you'll notice a series of crosses carved into the stone: the crosses were ordered by the Bishops of Capri so as to ask for divine protection against the frequent rock falls which landed on the steps. Worried? Don't be! The steps were meticulously restored in 1998 and scrupulously maintained wire nets now do what only God could do in centuries past. Other treasures you'll come across on route include the ancient chapel dedicated to Sant Antonio of Padua, the patron saint of Anacapri. At the end of the steps, you'll soon spy a stone archway, which once marked the border between the towns of Anacapri and Capri. How long will it take to climb the Phoenician Steps? Just how long you take to reach the top will, of course, depend on how fit you are. Sporty types can expect to complete the stairs in less than 40 minutes; chronic couch potatoes or anyone who hasn't climbed up quite so many steps before, should take it easy and give themselves a couple of hours - after all, with views like these, who wants to rush? Once you arrive in Anacapri, makes sure you visit Villa San Michele: the panoramic museum-house built by Axel Munthe, at the top of the steps. This is the perfect tour for those visiting Capri for just a brief time. Since this tour takes you along the calmest side of the island, it is an excellent alternative to the classic island tours which may not be able to sail on certain days due to sea conditions. It's also a great way to take an amazing photo in front of the famous Faraglioni rocks! The MIND BLOWING tour and Prosecco! Boat tour around the island visiting Faraglioni, the Blue Grotto and relaxing with Prosecco wine on board!